So week one past just like that and we have done NOTHING! Maybe that is a good thing! Going home was well needed after the last few weeks in the UK. As a Swede and a small business owner I took this whole brexit thing very hard. So going home has given me lots of hope and also some ideas how our business will survive this (well hopefully). Anyhow! Normally we go to Sweden for a few weeks since I really like the girls to work on their Swedish, I am really bad at speaking Swedish to them…oh well we are getting there! So the first two weeks it is just the girls and myself then Richard will join us as well. We have booked in to see a few of our amazing suppliers as well as lovely friends when he arrives which will be great. But at the moment we are visiting lovely local independent shops full of designs I personally love, exploring the forest behind my mums house and eating way too much. Sadly the weather is absolutely rubbish here, I can not remember the last time I have seen showers like this, it is cold, wet, dark, rather dull to be honest (it’s very disappointing). We try to go out for some walks when the worst is over and have been out picking blueberries and wild raspberries in the forest. Buying blueberries in the shop in UK, well for me they are not blueberries, these ones we pick our self, we got purple fingers (Lovisa was purple all around her mouth) and they are really colourful and tasty. Also found lots of raspberries so once again I need to concur my fear of snakes and also tics… oh man I hate those tics. Found one or two on my mums dog and cats…yuck! Even though they are covered in lots of protecting stuff they still get them, guess it does not help there are lots of roe deer here and they are covered in those vicious little horrid unnecessary blood sucking creatures. Otherwise we just chill, which I think has been very good for Stina, she is tired emotionally after her first year at school. So hanging with cousins, visiting family, playing with new friends, me having tons of Fika (yes all my clothing is a bit tighter than a week ago) and so on is rather relaxing. Oh yes and Pizza, no there is no better Pizza in the world than SWEDISH Pizza. Any Swede who says anything else is not a true Swede (I am serious)! I hope you are having a nice time as well and that the weather is better than here (however at this moment I am sitting in the sun on the veranda, hope this will last at least one day). And our clearance sale is still going at Spektakulär. Still lots of lovely designs. Please do note that these are designs that will not be reordered again so pop in and grab a bargain. It is with mixed feelings we say goodbye to Summer and welcome Autumn. I mean who does not like the idea of a warm summer and long evenings in the garden with a tasty BBQ. This summer did sadly not bring great weather, at least not where we were. We missed the beautiful August heatwave in Sweden by spending our holiday there in July. But hey it was fine we got a few days of swimming in the lakes and one or two BBQ’s. We survived! Here are just a few images for you and for me to go a bit homesick (great). Spent a lot of time here as a child. Love that they have restored it and keeping it safe. This is were I learnt to swim during summer swimming school, I guess I was about six or seven or maybe even nine, well I was not four that is for sure! Gosh, they just loved it here, and I don’t blame them, I spent a lot of time here every summer as a child. View from the Castle… Gosh am going all homesick now! Just behind my mums house is a forest and the blueberries were ready to be picked. Just go in…no need for me to tell you why! So a quick Summer holiday note. Yes of course we went to Sweden, it is my home and where I would like us to live one day so a lot of Swedish for the girls and lots of amazing food for me. The girls and myself two weeks alone (well with my family and friends of course) and then Richard joined us for two more weeks. We ended our holiday with 24 hours in Copenhagen…oh Copenhagen we love you and we will try to do a longer trip there again next summer. Since we arrived back it has been non stop, the shop has been repainted and it does look clean and fresh. Stina has started P1 and I did not expect it to be as emotional as it has been (think grey hairs appeared, not nice when you not even reached your mid 30’s yet or maybe I am just being shallow). At least the shop is looking lovely and this week we had a photographer in to take photos for Google. So now if you google us you can see inside the shop. Of course we can not keep it looking this lovely all the time (you who have been in at Christmas you know how full it can get) but it gives you an idea of what we actually look like inside. Now we like to welcome Autumn. I personally love Autumn. A sunny day walking in the forest with an explosion of colour in the trees and that hint of nip in the air. We are lucky to live in a country with four seasons. Even though not as extreme as Sweden, where it can get really hot in the summer and very very cold in the winter it is still stunning and I really need to make an effort to take the girls out and pick leaves and enjoy the colours as well. 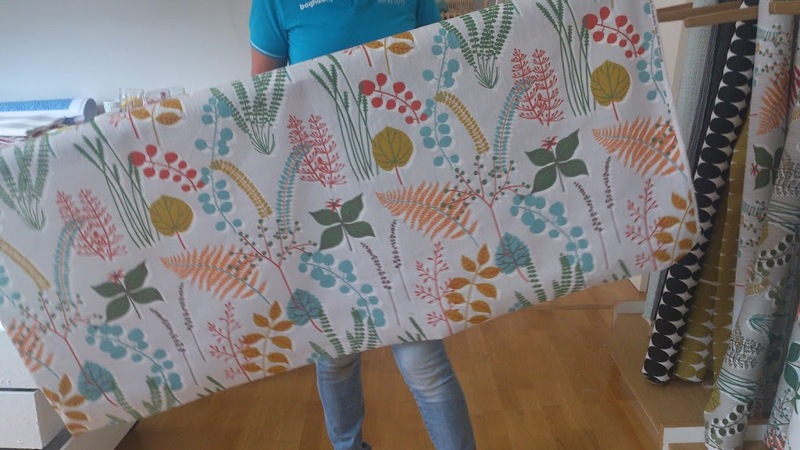 Here at Spektakular you will see more designs and also some new brands, I have just placed our blanket and throws order from Swedish Klippan. I am very close to turn on the heating every evening now (not yet please) and it is also time to place orders for more candles. Autumn does bring darker evenings which means hello sofa, cozy blanket, candles, tea, homebakes and great books. This weekend Richard and I will head to lovely London and two days of intense shopping for Spektakular. We will catch up with our suppliers, see more brands. After our visit to Sweden this summer I also fell in love with a few new brands and I have booked in to see some new agents which is very exciting. But first, hopefully this week the first new seasonal stock by Swedish Sagaform is due to arrive. Including new additions to the so ever loved Oval Oak range which I am really looking forward to see. DELIVERY! Yes I am shouting it, because I want you all to know how much I love this stunning brand. SPIRA and a massive delivery just arrived to the shop and it looks stunning and I which I could take all the cushions home and just create a cushion paradise. Alright fine I admit, I go on and on and it does sound a bit much but sometimes my love for designs just gets me a little bit too excited. And there is something about fabrics and stunning patterns. Such a easy way to transform a room. 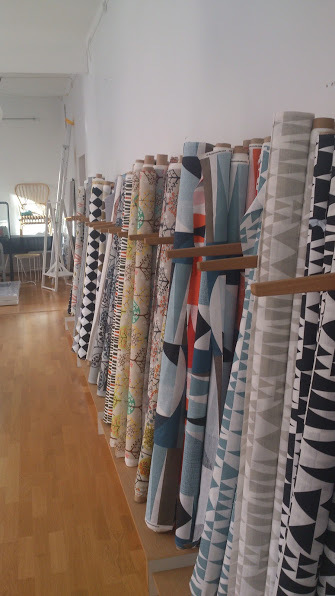 Spira is a fantastic company run by Lena and Susanne, together with well known designers in Sweden they create stunning patterns. The idea behind Spira is lovely. Each season brings in new and fresh patterns which you can combine with a previous seasonal patterns. Four times they have been in nominated for the best design in Formex Formidable which is a fantastic achievement . 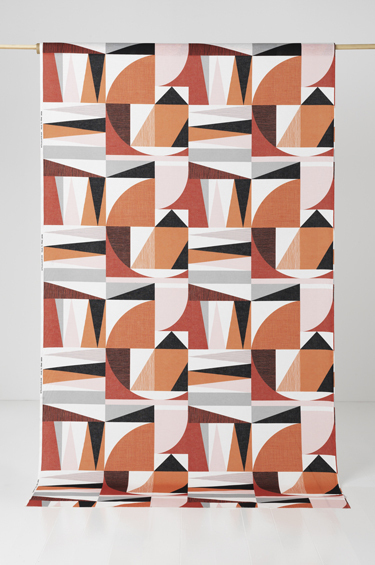 Latest was the Nemo in Red, (of course we have this cushion in the shop right now). This Summer we took the opportunity to visit Spira who are based in Borås, only 35 min from my mums house so easy to get there. Lena met us and welcomed us to have a look around their studio and warehouse. I could have moved in right there and then. What an amazing location and layout. Oh a dream place to go to work to everyday. We were shown the latest designs and also learnt a lot about fabrics and colours which was very inspiring. Oh I loved it and then to receive this delivery is fantastic. We focus mainly on cushion covers but of course some runners and tea towels sneaked with as well. Good thing with Spria is, if you know exactly how much fabric you are after they will cut it for you and send it to us. Since we do not have space for big rolls of fabric this is brilliant and a win win for us all. 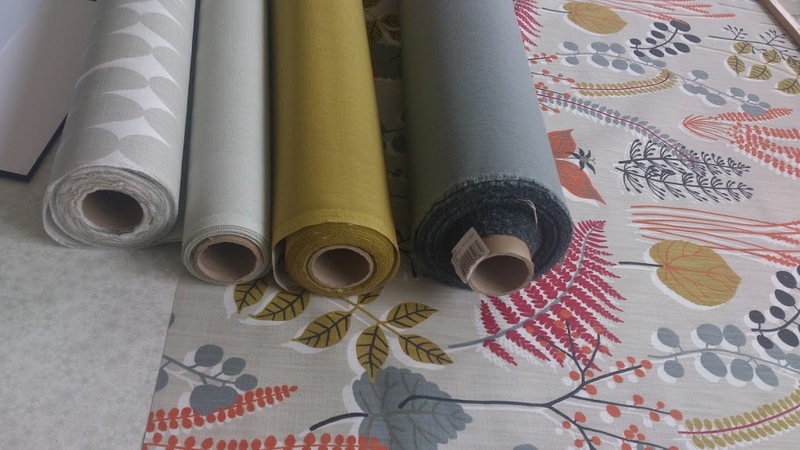 Please do have a look on their website for brilliant fabrics and inspiration. Pop in and see all our cushions, they do make us happy!